Things have been moving at a breakneck speed in Magento universe. The recent takeover of Magento by Adobe just added to the excitement. Magento focused on B2B e-commerce for quite some time now. Looks like the B2B features of Magento and the investment on Magento’s product is set to pay its dividends. With B2B sales about to reach $1.13 trillion by the year 2020 (as reported by Forrester), Adobe (by the acquisition) seems to have positioned itself quite well. While Magento has been in the front-end of the e-commerce game, it has been losing its ground in the B2C space to the likes of Shopify, BigCommerce, and WooCommerce. This shift can be attributed to the change in the nature of e-commerce. Online stores started popping up very quickly and the market expanded very quickly. While the Magento, as always, has a strong code, the competition was quick to react to the market dynamics. Shopify and the likes of them made it extremely easy to set up a small shop. Magento took note of it. When B2B e-commerce started to pick up the pace, Magento did not repeat its mistakes. 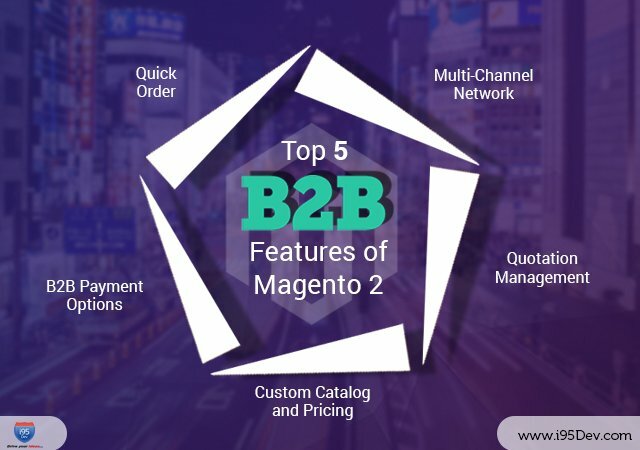 Reacting to the market, Magento was quick to launch new modules to support B2B business requirements in the form of Magento 2. Today, Magento is quickly gaining ground in the B2B e-commerce market. Magento provides quite a few out of the box B2B features for e-commerce merchants through the Magento Open Source and Magento Commerce. Below are some of the best B2B features. The latest version of Magento allows users to upload lists of SKUs to place an order. Users can order from their history, or place recurring purchase request to suit their needs. Intuitive user interfaces aids in rapid re-orders workflows definition. The user interface requirements of the B2B store is quite different from the B2C store. Ordering on a B2B store is more about finding the right product and placing the order rather than anything else. This feature satiates that need. B2B value chain comprises of many parties. The e-commerce platform must be flexible enough to map the network. Companies with multiple branches and multiple brands need clear demarcations between business entities. Magento’s new interface provides this much-needed feature out of the box. The interface allows the admin to create multiple business entities, brands, storefronts, etc. Permissions and access levels help control these entities. B2B e-commerce online store must replicate the offline experience. Price of a commodity vastly varies based on the quantity in a B2B transaction, in addition to various parameters. Negotiations and price quotes are vital to this process. The same negotiation and quotation process is handled online with the new Magento platform. This feature allows the appropriate use to raise quotes, approve them and escalate them as needed. The feature can also suggest the buyer to increase the quantity to avail discount, which aids in upselling. It is critical for a B2B store to maintain customer specific catalogs. These catalogs have custom products and pricing. B2B store leverage on this to reward and retain their best customers. This is a very critical aspect for B2B e-commerce and it is taken care of by Magento B2B module. Magento can also integrate with ERP to make sure the pricing and inventory are in accord. This can be vital for many companies where ERP acts as a primary database. Payments in the B2B scenario are as complex as they get. With options like net terms and line of credit, payment can be specific to each customer. Like an offline business, online store must accommodate these needs. These options can also aid in customer relations as the relation with the customer dictates the credit terms. The e-commerce platform must accommodate these payment systems for the success of the online store. Magento extensions, long with the native features, can handle a multitude of payment options. Online stores can integrate with other platforms to check the credit status of a customer, before approving the checkout. With additional Magento add-ons, you can have access to payment options like net terms and parent-child account management, where the parent entity is billed to for all expenditure made by child entities. The i95Dev team helped numerous customers over the past 18 years. The above information is an essence of what we learned from helping these companies scale rapidly. To know more about how we can help your store, contact us on info@i95dev.com.